Kids and pets — what joy they bring us! Still, conflicts can arise from the combination of grandchildren, pets and grandpets. The conflicts can run both ways: Grandparents can have a problem with their grandpets, or the grandparents' pets can be the issue. Both situations require diplomacy, because pet owners often consider pets members of their family. Families can split up over Fido or Fluffy just as easily as they can over Uncle Fred. Dogs and cats are the primary sources of pet problems, but other pets can rub people the wrong way. If you've ever had a gerbil on the loose in your house, or been disturbed by a noisy parrot, you're acquainted with some less common pet problems. Here's a primer on pet problems and some suggestions about how to handle them. The kids and grandkids are planning to visit and bring their pets. The grandchildren are welcome, but you're not looking forward to dealing with the grandpets. If you do not feel safe around the grandpets or if the pets destroy your property, you are justified in asking your family to board them instead of bringing them to visit. If boarding isn't a suitable solution, many areas have pet sitting services that may be more workable. The sting of banning the pets may be eased if you offer to pay for the boarding or the pet sitter. Although you are in no way obligated to pay for pet care, it may be a diplomatic move to do so. Perhaps you simply don’t care for the grandpets. Perhaps they have bad habits. Dogs may bark or beg at the table. Cats may scratch the furniture or walk on the kitchen counters. In most cases you should probably grin and bear it. The saying, “Love me, love my dog,” reflects the feelings of many pet owners. If you can’t love your grandpets, at least try to cultivate a liking for them and give them a chance to grow on you. In some cases grandparents end up falling in love with a grandpet. 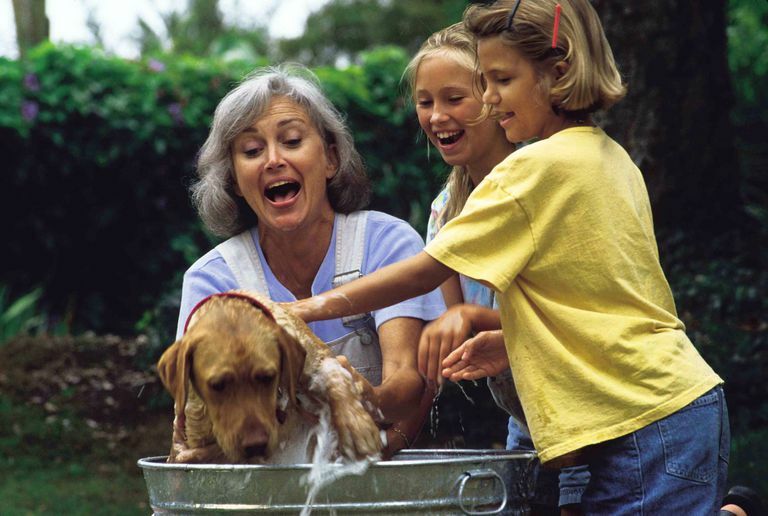 Many pets who live with older adults aren't accustomed to children. Some pets — especially cats — react by simply hiding out when the grandchildren are on the scene. Other pets are not that accommodating. Many pets will gradually become accustomed to the grandchildren. Others never will, especially if your grandchildren live out of town and are infrequent visitors. Sometimes grandparents have elderly pets that don’t see well or that have other disabilities that prevent them from adjusting to new people. If you even think that a pet may bite a grandchild, you should keep your pet separated from the grandchildren for the duration of the visit. If you do not have a secure location for your pet, or if the grandchildren are coming for a long visit, you should consider boarding your pet. The bottom line is that you should do whatever you need to do to keep your grandchildren safe. Dog bites can be serious, and cat bites and scratches can be a cause for concern, too. Although they aren't usually as serious as bites, allergies to pets are no laughing matter. Perhaps a grandchild has allergies that are aggravated by your pet, or perhaps you have an allergy to their pets. Either circumstance can be cause for concern. Cats are probably the worst pets for triggering allergies, but people can be allergic to dogs, too. People can also have allergies to small mammals such as rabbits, guinea pigs, hamsters, gerbils and rats, with the additional difficulty that some people are allergic to the shavings or other materials used for bedding. There is no real solution for pet allergies, but there are measures that will help. A person who is allergic to his or her own pet can sometimes take allergy shots, but that measure might not be justified for a pet that one sees only occasionally. If you are expecting a visit from an allergic child or grandchild, and you have a pet, a thorough cleaning of the house will help. If the allergic person will be spending the night, his or her bedroom should be kept shut so that the pet does not have access to it. The pet should also be bathed before the visit. If you are the allergic person, you may not be able to rely on your child's family to do a thorough cleaning for you. You may have to book a room somewhere and see the family mostly in neutral territory. Regardless of whether it is a child, a grandchild or a grandparent who is allergic, proper medications for dealing with allergies should be kept close at hand. 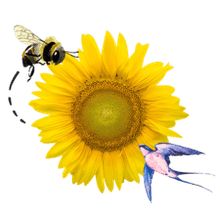 If the allergy produces asthma, which can be more serious than other allergies, none of these measures may offer sufficient security against an attack. Sometimes grandpets get the royal treatment. They get the most expensive pet food. They get pet beds, toys and even clothes. Their owners think little of paying big vet bills. Maybe they pay for pet insurance. As long as your grandchildren are not endangered by the presence of a dangerous pet, how your family members feel about their pets and how they indulge them is no business of yours. Grandparents who respect boundaries do not second-guess the decisions that children and grandchildren make about pets. Given the depth of affection many feel for their pets, a major rift in the family could occur if you question the feelings or behavior of family members where pets are concerned. Maybe you are the one besotted with a pet. Your family doesn't understand the depth of your feeling for your pet. Maybe you don't understand it yourself. If you have a pet that brings companionship and joy into your life, accept that for the gift that it is. Don't let others spoil your enjoyment of your pet. Numerous studies have shown benefits from pet ownership. The companionship of a pet can reduce stress, lower blood pressure and improve mood. Companion animals can be especially important to elderly people, especially to those who have lost a spouse. Whatever your age or marital status, you are not alone in feeling that your pet is a vital part of your life. Pets are so important to so many people that they are often mentioned in obituaries. Sometimes they even appear in wedding announcements or receive bequests in their owner's wills. If you are crazy about your pet, you have a lot of company, and you are in good company.